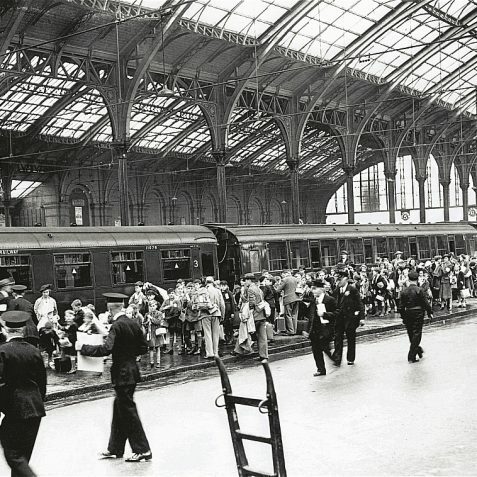 September 1939: evacuees arriving at Brighton Station during Second World War. 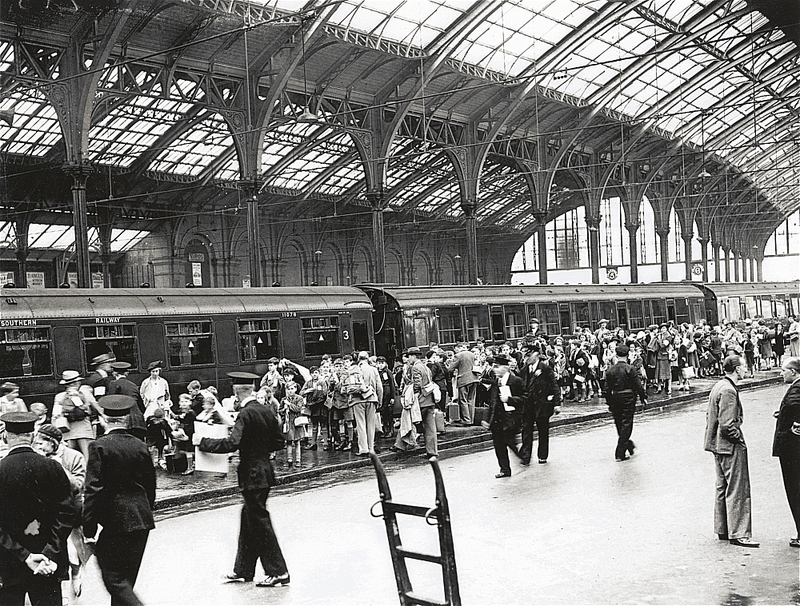 Crowds of children carrying gas masks can be seen gathered by a train, with numerous guards in attendance. 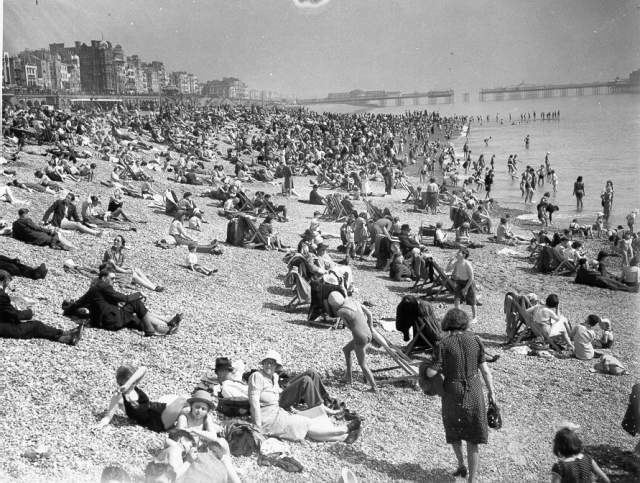 Brighton beach, packed with holiday makers during the spring of 1940, the beach was closed to the public in June 140 when work on anti-invasion defences began. 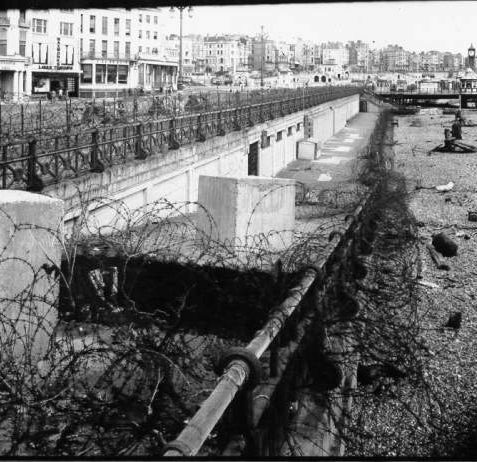 Palace Pier can be seen in the background, a section of the walkway has already been removed to prevent the pier being used to land troops; the beach was soon blocked with obstacles and mines as part of the anti-invasion defences. 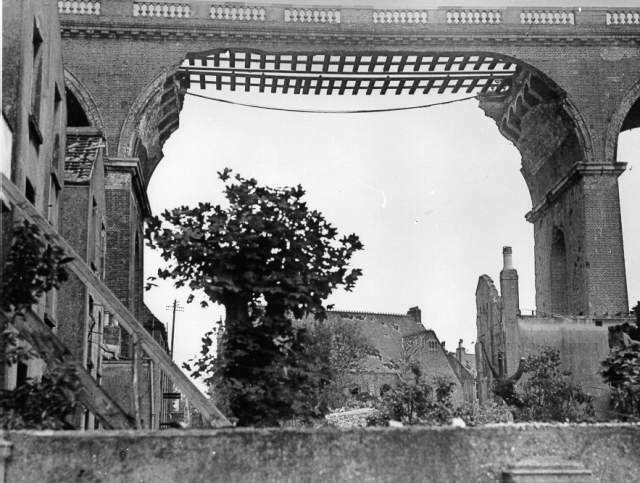 A span of Preston Road Viaduct destroyed in one of Brighton's worst air raids on 25th May 1943. 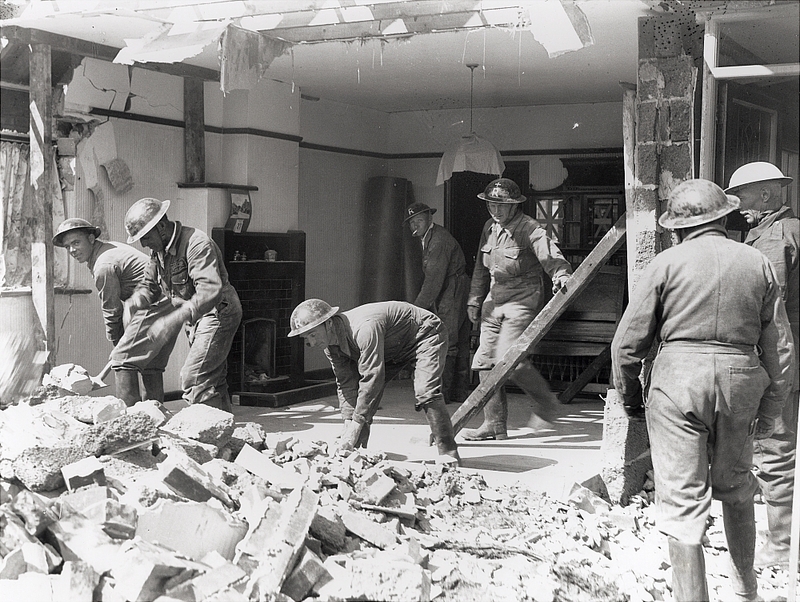 Civil Defence volunteers search through the rubble of an unidentified house destroyed in an air raid. 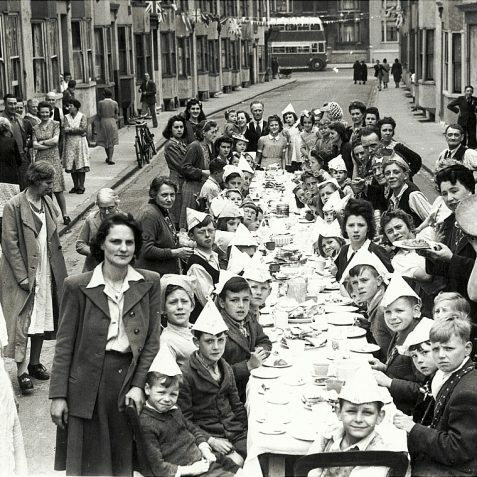 May 1945: a Victory in Europe street party held in St Paul's Street, Brighton. 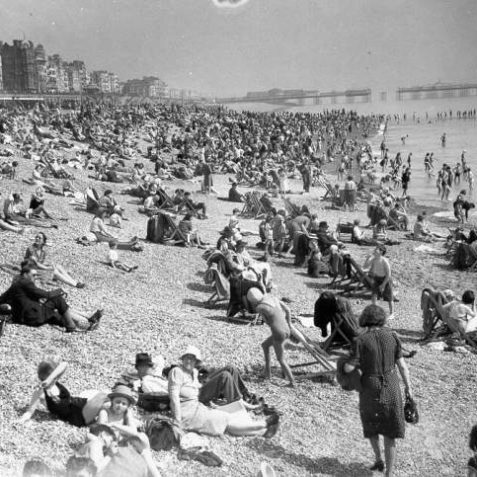 The first raid on Brighton came on 15 July 1940 when Kemp Town was bombed, and was followed by several others that month, mainly over Whitehawk and Kemp Town. 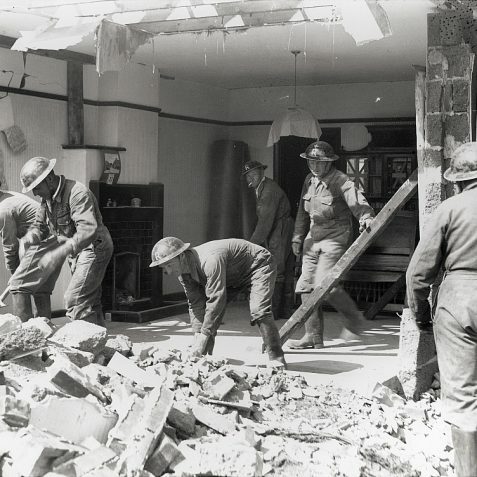 At 3.30 p.m. on 14 September 1940 twenty bombs fell on Kemp Town; four children and two adults were killed when the Odeon Cinema in St George’s Road received a direct hit and another forty-nine died in the surrounding area. Daytime raids continued throughout 1941 and into 1942, and eight people were killed by German fighter-bombers in late 1942. From 17 December 1942 a 9.30 p.m. bus curfew was operated except for night workers, but the following day Rottingdean was hit and the Steyning Road vicarage was destroyed. A direct hit on the Black Rock gas-works resulted in a 300-foot orange flame. The heaviest raid occurred on 25 May 1943 when the town was dive-bombed by German fighters. 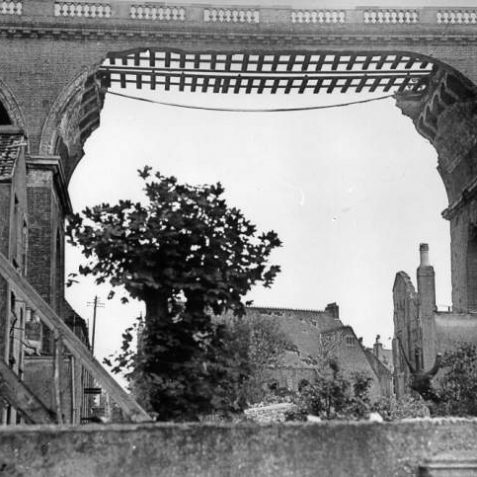 Twenty-four people were killed and fifty-one seriously injured as the planes strafed pedestrians in the streets, and the London Road viaduct was seriously damaged. In a night raid in September 1943 thousands of incendiary bombs were dropped, destroying part of the railway works and a gas main in London Road. Another raid saw bombs fall in the Pavilion grounds, shaking the Dome walls out of the vertical, but the crater was put to use as a static water tank. 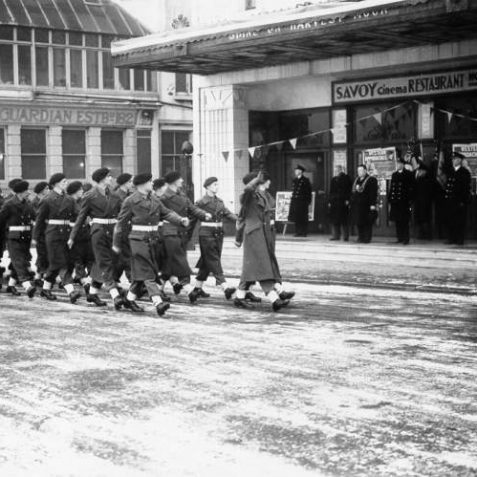 With the course of the war swinging in the Allies’ favour the ban on visitors was lifted by 1943, but was reimposed in August and September 1943 and prior to D-Day, 6 June 1944. 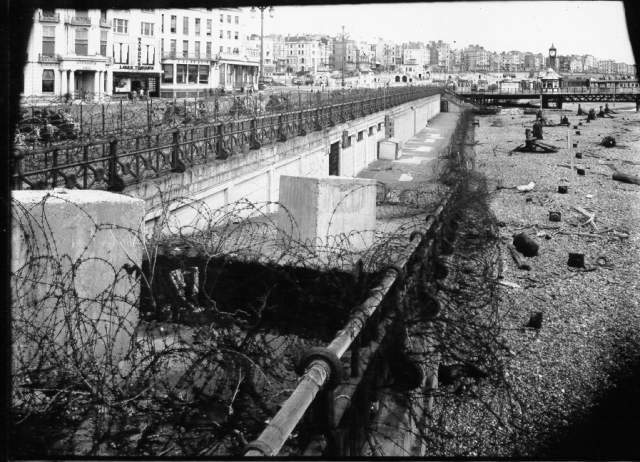 The last raid on the town was on 22 March 1944, but from 1939 until 1945 Brighton suffered from 1,058 siren warnings; 685 local alarms and 56 actual raids; 381 high explosive bombs were dropped along with numerous incendiary bombs; 198 people were killed, 357 seriously injured and 433 slightly injured; over 200 houses were destroyed, 894 seriously damaged and 14,232 slightly damaged. The worst hit areas were Albion Hill; the area between Carlton Hill and Edward Street; Essex, Hereford and Montague Streets; the Chichester Place area; Bennett Road and Rugby Place; and Preston village. Fortunately, few of the architecturally distinguished buildings were destroyed, these being three houses in Park Crescent, three in the upper part of Chichester Place and two in Norfolk Square. 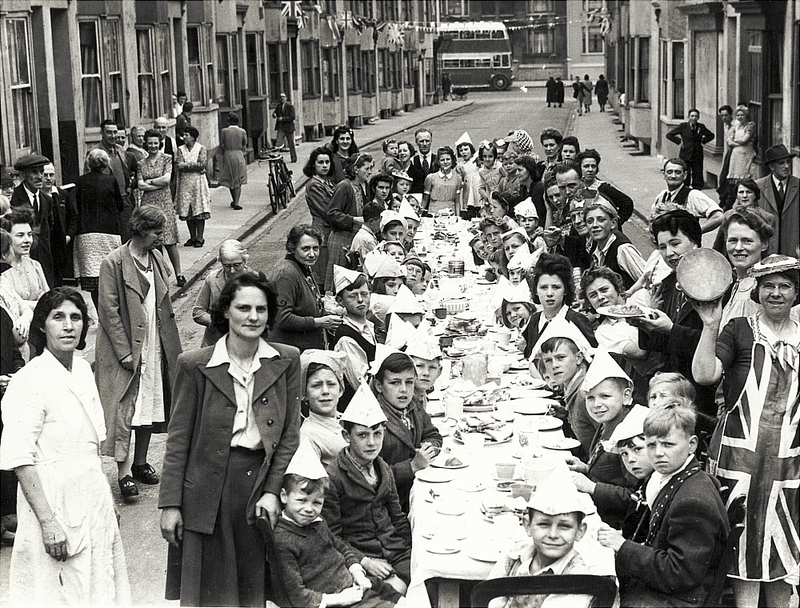 Brighton greeted Victory in Europe Day, 8 May 1945, with great celebration. 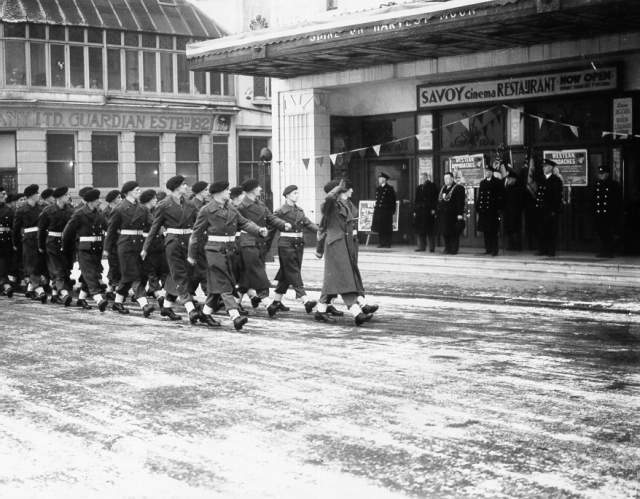 The mayor read a proclamation of victory from the Town Hall balcony to a large and enthusiastic crowd, bonfires were lit on the Downs and beaches, and street parties were held all over the town. Further celebrations were held on Victory in Japan Day, 15 August 1945. I was brought up in 19 St Paul’s Street. My mum and uncles are in this picture and so are a few of our neighbours. My nan, Aggie Hope, always had an open door and our house was always full of family and friends. It was a very happy house and my friends still comment on my nan always having a hot meal on the table. My nan brought us all up while my mum, Pamela Hope, worked at the Co-op in the Hanover area. There was my mum, my sister Cheryl Hope, my Auntie Carol and her two daughters, Mandy and Debbie Gower, all living in a three bedroom house. They were the best days of my life. My aunt Kit and uncle Harry together with granddad Trott were bombed out when Kemp Town was raided. Other relatives nearby also suffered and we had one family of the Trott relatives living with us at Newick Road for about a year. I can also remember seeing three fighter bombers flying along the route of the railway line from the Lewes direction when Brighton Station was bombed by them. At the time I was excited at seeing those German aircraft with the distinct crosses on their wings then shortly afterwards hearing the explosions. My dad, as a youngster, lived in St Pauls Street. He was in a large family of mainly girls but would have been serving during the war. I believe they lived at No 1 and went to St Martin’s school. I lived at 32, St Paul’s Street with my Nan and Granddad as a child in the ’50s and ’60s. I played in the street with Carol Guile and Lynda O’Leary. I lived opposite the Hope family and Carol Hope used to take me to School at St Martin’s around the corner, Miss Baker was the head teacher at that time, and Miss Hapman ? was also teaching there. My Nan (Maggie Attrell) is the lady in the white overall in the left forefront of the picture, next to her is Annie Mitchell. My uncle’s are also boys in the photo. Lots more info but not enough time to write it up. From Angela Wilson. Hi Angie. Carole Hope was my auntie and I still see Carol Guile sometimes. Mrs Hapman is still alive and living in a home up Bear Road bless her. My Carol now lives in Bevendean near me.